OpenShift offers one-click attachment of a Jenkins instance to your application. When created in this way from within an application’s dashboard, it will be automatically configured to deploy changes pushed to your gear’s git repository. Go to the dashboard for the app you’d like to add Jenkins to within the OpenShift Online Console. Under “Continuous Integration” click the “Enable Jenkins” link. On the next page either leave the default application name of jenkins (so your Jenkins URL will be http://jenkins.yoursitename.rhcloud.com/) or name it something else. Click the “Add Jenkins” button to install the new gear and link it with your application. On the next page note the user credentials for the Jenkins instance, then navigate to the “appname-build” job page on Jenkins at https://jenkins.yoursitename.rhcloud.com/job/appname-build/. Push code changes to your application’s repo on OpenShift as you normally would. Rather than seeing the deploy process in your console you should see “Executing Jenkins Build” and the build status. Jenkins will create a temporary “builder application” called “appnamebldr” for executing the build (more info) which will be deleted after 15 idle minutes. Scan through the console output of the build to see that all went well. If the Jenkins build status is SUCCESS at the bottom your updated application code should be deployed to your gear. Note: Alternatively you may wish to trigger this build by using Node to run a script like this one, use the official Jenkins CLI tool or even trigger the build via email. I’ve found the first build often fails due to the builder application not having completed booting up yet (it powers down after 15 minutes of inactivity). For this reason I use the Jenkins Startup Trigger plugin to ensure the build starts when the builder application does. Navigate to Manage Jenkins > Manage Plugins and click the “Advanced” tab. Then click the “Check now” button at the bottom of the page to check for the latest plugin updates. Click the “Available” tab and search for the “Startup Trigger” plugin. Install this. In your project’s settings you’ll now have “Build when job nodes start” as a “Build Triggers” option. Enable this and fill in the name of the builder application e.g. “productionbldr”. This will trigger builds when this builder application starts, rather than when the master Jenkins instance starts which is the default. If you’re using CloudFlare in front of your website you may want to purge the cache after your code has deployed as part of the build script. In these instructions we’ll fetch the CloudFlare Zone ID for your domain and use it in a curl command to purge the domain’s CloudFlare cache. 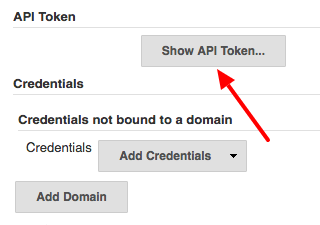 Get your “Global API Key” from your CloudFlare account settings page. Note: An alternative would be to enable CloudFlare’s “Dev Mode” before the deploy and disable it after the deploy.